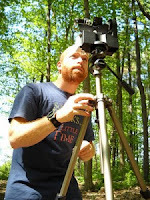 Fine Fellow Alex Smith wrote a fantastic article about his experience with gigapan for the quarterly newsletter of the International Barcode for Live Project. Alex concludes, "There are many parallels between the GigaPan and DNA barcoding as complementary forces for democratizing information and bolstering bioliteracy. Both are publicly accessible, both will be annotated through time by a community of experts and non-experts alike and both exist as a synthetic connection from the digital to the natural world. One key to our capacity to understand the changes caused by the increasing pressures of the urbanization and degradation of natural environments will be ongoing monitoring through time. If such monitoring is democratized and publically available as DNA barcodes and GigaPans, then a marginalized environment may become more valued by the human population." Check out the full article at http://ibol.org/gigapan/. The CREATE Lab and Carnegie Mellon University, with The Fine Foundation, are pleased to announce the first Fine International Conference on Gigapixel Imaging for Science. Aiming to explore innovative use of GigaPan in the classroom, the field and the laboratory, the conference will feature all aspects of gigapixel technology in the science field. Early registration ends September 13, 2010.